View cart “Selenium +” has been added to your cart. 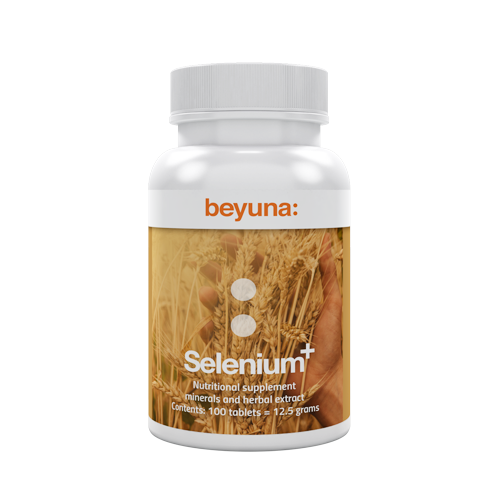 Beyuna Selenium+ contains the patented product Selenium SeLECT® and Bioperine®, an extract of black pepper. Selenium contributes to the normal function of the immune system. Selenium contributes to the normal thyroid function. Selenium contributes to normal spermatogenesis. Calcium Carbonate of natural origin 40% Ca. Take one tablet per day with a glass of water with a meal. Selenium is a trace element that is indispensable for the growth and functioning of live cells in humans and animals. Many Dutch people consume too little selenium despite a good diet. This is because there are no longer enough of these trace elements in European soil. As a result, not only crops, but also meat and dairy products contain too little selenium. There are organic and inorganic forms of selenium. Plants take selenium from the soil and convert it into organic forms that can be easily absorbed. L -(+)- selenomethionine is the form of selenium that is most prevalent in natural foods. L -(+)- selenomethionine is an amino acid L-methionine with a selenium atom replacing the sulphur atom. Selenomethionine is thus something very different from selenium chelated to methionine (or other amino acids). Selenomethionine is unique because selenium as a whole is part of the molecule, and is therefore completely incorporated into the body proteins. This makes selenomethionine not only safer, but also more bioavailable than other inorganic types of selenium. L -(+)- selenomethionine is rapidly and fully absorbed from the gastrointestinal tract. Inorganic forms of selenium are for example sodium selenite and sodium selenate; these are not natural forms of selenium. Beyuna has therefore opted for Selenium SeLECT, which consists of L -(+)- selenomethionine and bioperine. Bioperine is black pepper extract, containing standard 95-98% Piperine. A study has shown that bioavailability is even higher when bioperine is added. Five volunteers received 50 mg of SeleniumSelect and five others received 50 mg of SeleniumSelect supplemented with Bioperine. In the SeleniumSelect® group, selenium levels were about 30% higher after two weeks of supplementation. The volunteers in both groups experienced no adverse effects. These preliminary results demonstrate that the bioavailability of selenium can be safely increased by taking Bioperine® at the same time.